Vanity thy name is . . . Sarah? Poor God. He’s forever having to teach me humility. And I’m forever bowing up on Him. I blame my parents. Dad taught me to have plenty of self-esteem, to be confident, to feel good about who I am. He told me I was beautiful and smart and successful (still does). My mom was supportive, but a touch more realistic when I was a kid. Now she’s my biggest fan by far. I know–what a curse! The problem is, I fail and I do silly things and, ahem, look like crap on occasion. So last night, when I got second place in the best, unpublished novel category at the Blue Ridge Autumn in the Mountains Novelist Retreat I was feeling pretty good about myself. You know, not quite as good as if I’d won first place, but clearly my parents are right. Smart AND beautiful. 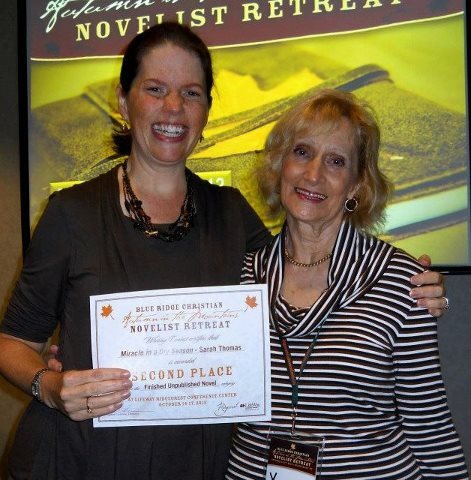 Then I found the photos of the awards ceremony posted on Facebook by author Deborah Raney. Eek. My husband told me to wear my hair down. And I should have raised my chin and my nose crinkles when I smile big and in comparison to adorable, petite Yvonne Lehman I’m a hulk and . . . egad I’m vain! So here I am folks, not necessarily at my headshot best. But look, I’m grinning. I’m standing next to a lovely lady who has written more than 50 books and is incredibly generous in sharing her time, talents and wisdom. And I’m getting a dose of writerly validation. You know, maybe that picture’s not so bad after all . . . Thank you God, for not giving up on me. ← What does God want? Sarah, congrats! GREAT JOB! And I think the pic just shows your exuberant joy on this occasion! Lovely! Thank you. And you’re right, no one else even notices the stuff that jumps out at me! Ah, there’s the mix of love and honesty I need! Love you back. LOL, Sarah, I’m glad I’m not the only one who overanalyzes photos of myself. Congrats on the contest success! Thanks! We can be self-conscious Sarah’s! Oh my goodness, congratulations! This is terrific news! You must be so excited. As for the picture, I love it. You see your true feelings of happiness shining through and that is beautiful! Thanks! It’s always good to have pride mixed in with a good dose of humility.